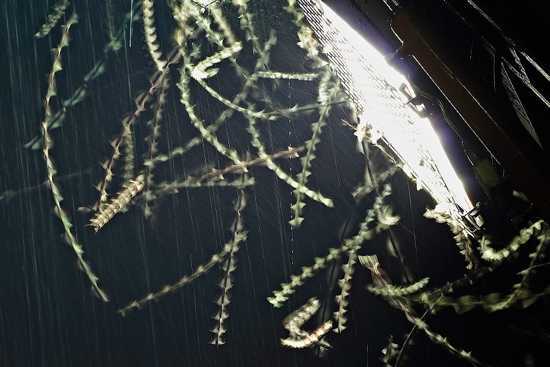 Rods (sometimes known as “sky fish” or “solar entities”) are elongated artifacts produced by cameras that inadvertently capture several of a flying insect’s wingbeats. Videos of rod-shaped objects moving quickly through the air were claimed by some to be alien life forms or small UFOs, but subsequent experiments showed that these rods appear in film because of an optical illusion/collusion (especially in interlaced video recording). Investigators have shown that rods are mere tricks of light which result from how images (primarily video images) of flying insects are recorded and played back. In particular, the fast passage before the camera of an insect flapping its wings has been shown to produce rodlike effects, due to motion blur, if the camera is shooting with relatively long exposure times. Getting no satisfactory answer to the phenomenon, curious scientists at the facility decided that they would try to solve the mystery by attempting to catch these airborne creatures. Huge nets were set up and surveillance cameras then captured images of rods flying into the trap. When the nets were inspected, the “rods” were no more than regular moths and other ordinary flying insects. Subsequent investigations proved that the appearance of flying rods on video was an optical illusion created by the slower recording speed of the camera. 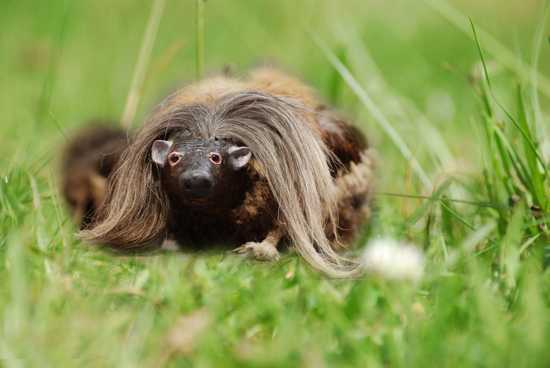 Wild haggis (Haggis scoticus) is a fictional creature said to be native to the Scottish Highlands. It is comically claimed to be the source of haggis, a traditional Scottish dish that is in fact made from the innards of sheep (including heart, lungs, and liver). According to some sources, the wild haggis’s left and right legs are of different lengths, allowing it to run quickly around the steep mountains and hillsides which make up its natural habitat, but only in one direction. It is further claimed that there are two varieties of haggis, one with longer left legs and the other with longer right legs. The former variety can run clockwise around a mountain while the latter can run anti clockwise. The two varieties coexist peacefully but are unable to interbreed in the wild because in order for the male of one variety to mate with a female of the other, he must turn to face in the same direction as his intended mate, causing him to lose his balance before he can mount her. As a result of this difficulty, differences in leg length among the haggis population are accentuated. 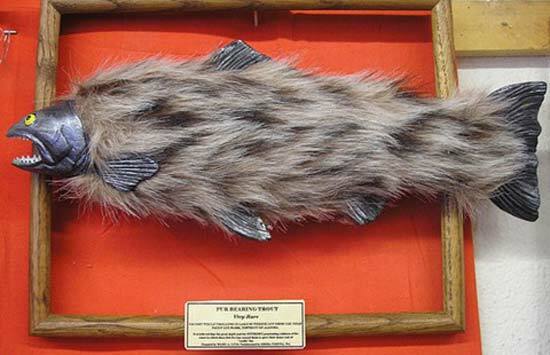 The fur-bearing trout (or furry trout) is a fictional creature native to the northern regions of North America, particularly Canada, Montana, Wyoming, Colorado, and the Great Lakes. The basic claim (or tall tale) is that the waters of lakes and rivers in the area are so cold that a species of trout has evolved which grows a thick coat of fur to maintain its body heat. Another theory says that it is due to four jugs of hair tonic being spilled into the Arkansas River. In reality, a possible source may have been a simple misunderstanding. A 17th century Scottish immigrant’s letter to his relatives referring “furred animals and fish” being plentiful in the New World, followed by a request to procure a specimen of these “furred fish” to which the mischievous Scotsman readily complied by making one up, is often cited. In fact, the “cotton mold” Saprolegnia will sometimes infect fish, causing tufts of fur-like growth to appear on the body. A heavy infection will result in the death of the fish, and as the fungus continues to grow afterwards, dead fish that are largely covered in the white “fur” can occasionally be found washed ashore. The skvader is a Swedish fictional creature that was constructed in 1918 by the taxidermist Rudolf Granberg and is permanently displayed at the museum at Norra Berget in Sundsvall. It has the forequarters and hind legs of a hare (Lepus), and the back, wings and tail of a female wood grouse (Tetrao urogallus). It was later jokingly given the Latin name Tetrao lepus pseudo-hybridus rarissimus L.
The name is a combination of two words, and this is the explanation provided by the Svenska Akademiens Ordbok (Dictionary of the Swedish Academy): The prefix skva- from “skva-ttra” (quack or chirp), and the suffix -der from “tjä-der” (wood grouse). The skvader originates from a tall tale hunting story told by a man named Håkan Dahlmark during a dinner at a restaurant in Sundsvall in the beginning of the 20th century. To the amusement of the other guests, Dahlmark claimed that he in 1874 had shot such an animal during a hunt north of Sundsvall. On his birthday in 1907, his housekeeper jokingly presented him with a painting of the animal, made by her nephew and shortly before his death in 1912, Dahlmark donated the painting to a local museum. During an exhibition in Örnsköldsvik in 1916 the manager of the museum became acquainted with the taxidermist Rudolf Granberg. He then mentioned the hunting story and the painting and asked Granberg if he could re-construct the animal. In 1918 Granberg had completed the skvader and it has since then been a very popular exhibition item at the museum, which also has the painting on display. 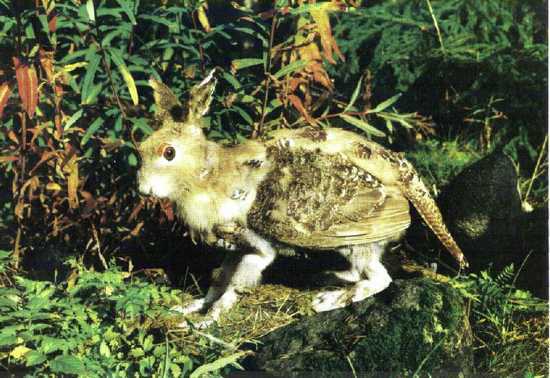 A strikingly similar creature called the “rabbit-bird” was described by Pliny the Elder in Natural History. This creature had the body of a bird with a rabbit’s head and was said to have inhabited the Alps. The jackalope is a mythical animal of North American folklore (a so-called “fearsome critter”) described as a jackrabbit with antelope horns or deer antlers and sometimes a pheasant’s tail (and often hind legs). The word “jackalope” is a portmanteau of “jackrabbit” and “antelope”, an archaic spelling of “antelope”. It is also known as Lepus temperamental us. During days of the Old West, when cowboys gathered by the campfires singing at night, jackanapes could often be heard mimicking their voices. It is said that a jackalope may be caught by putting a flask of whiskey out at night. 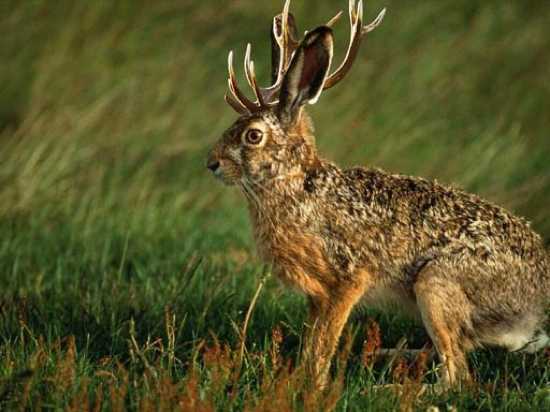 The jackalope will drink its fill of whiskey and its intoxication will make it easier to hunt. In some parts of the United States it is said that jackalope meat has a taste similar to lobster. However, legend has it that they are dangerous if approached. It has also been said that jackanapes will only breed during electrical storms including hail, explaining its rarity. According to the Douglas Chamber of Commerce, a 1930s hunting trip for jackrabbits led to the idea of a Jackalope. Herrick and his brother had studied taxidermy by mail order as teenagers.When the brothers returned from a hunting trip, Herrick tossed a jackrabbit carcass into the taxidermy store, where it came to rest beside a pair of deer antlers. The accidental combination of animal forms sparked Douglas Herrick’s idea for a jackalope. 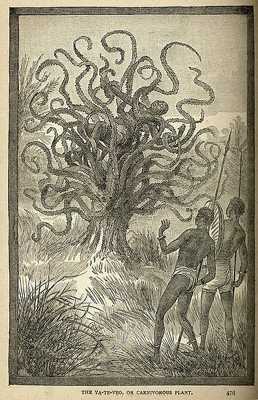 The tree was given further publicity by the 1924 book by former Governor of Michigan Chase Osborn, Madagascar, Land of the Man-eating Tree. Osborn claimed that both the tribes and missionaries on Madagascar knew about the hideous tree, and also repeated the above Liche account. 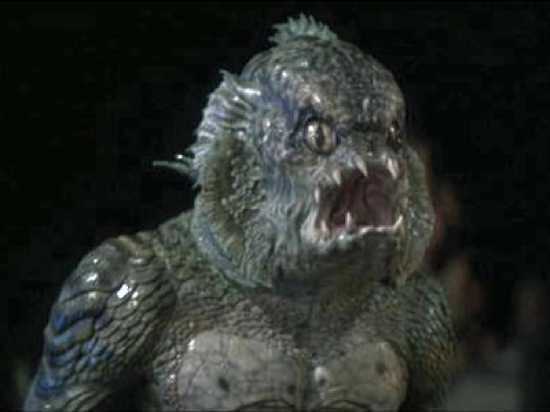 The boys described the creature as “shaped like an ordinary body, like a human being body but it had a monster face, and it was scaly [with] a point sticking out of its head [and] great big ears.” They believed the creature had a humanlike face, although it appeared to have scaly and silvery-blue colored skin. On 26 August 1972, The Province received a call from a man claiming to have lost a pet Tegu lizard in the area the previous year. Tegus, indigenous to Latin America and mostly carnivorous, can grow up to four feet in length. They are commonly kept as pets. The investigating police officers believed the lizard matched the description of the creature and the case was closed. Kasai rex is an animal claimed to be a carnivorous living dinosaur in Africa. There are conflicting descriptions of it, and the only original reports are suspected by most cryptozoologists to be dubious. In 1932 John Johnson (sometimes spelled Johanson), a Swedish plantation owner, was traveling with a servant in the Kasai valley, in the Belgian Congo (now Democratic Republic of the Congo). They encountered rhinoceros, and, while attempting to pass it without detection, were surprised by a large creature rushing out of the undergrowth and attacking the rhinoceros. The servant ran away and Johnson fainted. He awoke to see that the creature was eating the rhinoceros. “It was reddish in color, with blackish-colored stripes,” he said later. “It had a long snout and numerous teeth.” He decided that the creature, 13 m (43 ft) long, was a Tyrannosaurus. he also said “The legs were thick; it reminded me of a lion, built for speed”. ‘On February 16 last I went on a shooting trip, accompanied by my gun bearer. I had only a Winchester for small game, not expecting anything big. At 2 p.m. I had reached the Kasai valley (sic). No game was in sight. As we were going down to the water, the boy suddenly called out “elephants”. It appeared that two giant bulls were almost hidden by the jungle. About 50 yards away from them I saw something incredible – a monster, about 16 yards in length, with a lizard’s head and tail. I closed my eyes and reopened them. There could be no doubt about it, the animal was still there. My boy cowered in the grass whimpering. I was shaken by the hunting-fever. My teeth rattled with fear. Three times I snapped; only one attempt came out well. Suddenly the monster vanished, with a remarkably rapid movement. It took me some time to recover. Alongside me the boy prayed and cried. I lifted him up, pushed him along and made him follow me home. On the way we had to transverse a big swamp. Progress was slow, for my limbs were still half-paralyzed with fear. There in the swamp, the huge lizard appeared once more, tearing lumps from a dead rhino. It was covered in ooze. I was only about 25 yards away. It was simply terrifying. The boy had taken French leave, carrying the rifle with him. At first I was careful not to stir, then I thought of my camera. I could hear the crunching of rhino bones in the lizard’s mouth. Just as I clicked, it jumped into deep water. This story presents problems due to inaccuracies. The hunter claims that “giant bull” elephants were in the jungle – yet forest elephants Loxodonta cyclones are smaller than the familiar elephant L. africana of the plains. A large bull L. africana would have great difficulty in jungle terrain (Though, considering the size of all elephants, it is reasonable that the Elephant could still have been described as large). There is also the similarity between many aspects of these two stories: the single servant runs off; the creature eats a rhino; and both Johanson and Johnson faint. This suggests a single source for both stories. It is perhaps notable that, of all crypt ids reported from Africa, this is the only one without a unique name in a local language. A carnivorous animal of this size would not have escaped a unique name by the local population. Two photographs from the first two sightings are said to exist, each showing radical differences from the other. One shows a creature resembling a large monitor lizard. 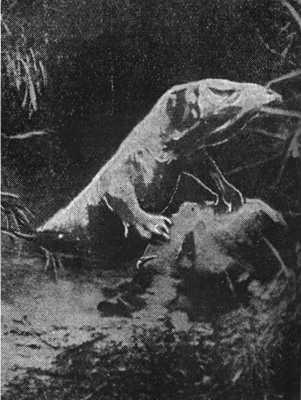 In this photograph, a white line surrounds the creature; it appears to be a cutout from a nature magazine. The other photograph depicts a Tyrannosaurus-like creature eating a rhinoceros. 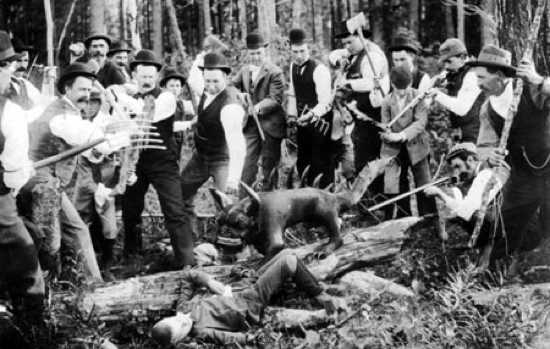 Shepard claimed to have captured another Hodag in 1896, and this one was captured alive. According to Shepard’s reports, he and several bear wrestlers placed chloroform on the end of a long pole, which they worked into the cave of the creature where it was overcome. He displayed this Hodag at the first Oneida County fair. Thousands of people came to see the Hodag at the fair or at Shepard’s display in a shanty at his house. Having connected wires to it, Shepard would occasionally move the creature, which would typically send the already-skittish viewers fleeing the display. As newspapers locally, statewide, and then nationally began picking up the story of the apparently remarkable, living creature, a small group of scientists from the Smithsonian Institution in Washington, D.C.announced they would be traveling to Rhinelander to inspect the apparent discovery. Their mere announcement spelled the end, as Shepard was then forced to admit that the Hodag was a hoax. Hull hired men to carve out a 10-foot (3.0 m) long, 4.5-inch block of gypsum in Fort Dodge, Iowa, telling them it was intended for a monument to Abraham Lincoln in New York. He shipped the block to Chicago, where he hired Edward Burghardt, a German stonecutter, to carve it into the likeness of a man and swore him to secrecy. Various stains and acids were used to make the giant appear to be old and weathered, and the giant’s surface was beaten with steel knitting needles embedded in a board to simulate pores. In November 1868 Hull transported the giant by rail to the farm of William Newell, his cousin. By then, he had spent US$2,600 on the hoax. Nearly a year later, Newell hired Gideon Emmons and Henry Nichols, ostensibly to dig a well, and on October 16, 1869 they found the giant. Newell set up a tent over the giant and charged 25 cents for people who wanted to see it. Two days later he increased the price to 50 cents. Archaeological scholars pronounced the giant a fake, and some geologists even noticed that there was no good reason to try to dig a well in the exact spot the giant had been found. Eventually, Hull sold his part-interest for $23,000 to a syndicate of five men headed by David Hannum. They moved it to Syracuse, New York for exhibition. The giant drew such crowds that showman P. T. Barnum offered $50,000 for the giant. When the syndicate turned him down he hired a man to model the giant’s shape covertly in wax and create a plaster replica. He put his giant on display in New York, claiming that his was the real giant and the Cardiff Giant was a fake. Hannum sued Barnum for calling his giant a fake, but the judge told him to get his giant to swear on his own genuineness in court if he wanted a favorable injunction. On December 10, Hull confessed to the press. On February 2, 1870 both giants were revealed as fakes in court. The judge ruled that Barnum could not be sued for calling a fake giant a fake.